Specialize in hauling stone, dirt, sand, and other aggregates. Servicing dump trucks, tractors, trailers, and other heavy duty trucks. Commercial Hauling Services and Heavy Truck Repair since 1985. For more than 30 years R.S. 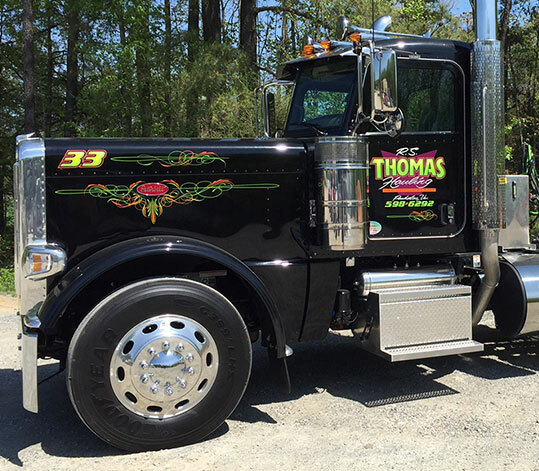 Thomas Hauling, Inc. has been providing commercial hauling services and heavy truck repair to VA and the surrounding states. With a fleet of the best trucks in the industry as well as top notch drivers, we’re able to haul just about any type of aggregate you need moved. Everything from stone, dirt and sand to any other type of aggregate, we have the expertise and equipment to serve you. Combine that with a service facility equipped with only experienced and trained technicians and that gives us the ability to tackle virtually any problem or repair you have with your heavy duty truck. Browse our site to see how we can best serve you!